When we titled this page anaerobic digestion basics we decided to include all the basic information someone new to Anaerobic Digestion would be looking for. We start out with a definition of the AD process, provide a menu of links to the other basic AD process concepts. If you scroll down further you will see additional background information about anaerobic digestion, which we thought our readers would find useful to learn a basic understanding of the AD process. Anaerobic digestion (AD) is a biological process similar in many ways to composting, but without air. It is a natural treatment process and, as in composting, bacteria break down organic matter and reduce its bulk or “mass”. Its huge advantage is that it produces a gas called biogas which is 50% to 75% methane, and that’s a clean-burning gas with huge potential for reducing carbon dioxide emissions. Watch the following video if you would like to see an introduction to “state of the art” Anaerobic Digestion (at a Dairy Farm), and how the basic anaerobic digestion system it is being enhanced by adding further processing, providing additional products and income. Doing this can greatly increase the financial profitability of on-farm anaerobic digestion (biogas) plant installation. Part of understanding the anaerobic digestion basics, is an appreciation of the differences between anaerobic digestion and composting. a net positive surplus generation of energy as a biofuel to allow power production from methane gas (biogas) produced by the organisms. Photo at top of page: A Greenfinch Anaerobic Digestion Plant which was built during 2004/5 for use on a farm. Why are we excited about Anaerobic Digestion (AD) just now? Farm waste requires better management: As from 2006 the EU Waste Management rules have been applied to farming and agriculture. The historical exemption of farming from compliance with waste disposal regulations having been been removed. This is in some instances encouraging uptake of anaerobic digestion as an on-farm waste disposal method. Farms Must Now Store Slurry to Prevent Run-off Causing Pollution: New regulations which were implemented in 2012 and avoid its discharge, and this often requires a provision for 6 months of storage. 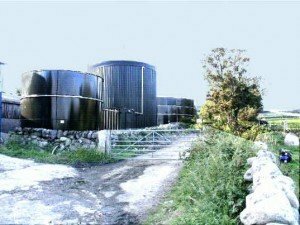 Rather than invest in tanks of this size, farmers can treat their slurry by AD and gain an income from the biogas, while at the same time reducing their slurry lagoon (or tank) storage requirements. Organic waste must be diverted from landfill: This is the result of the EU landfill Directive and AD is an excellent technology for organic waste landfill diversion. Rising demand for renewable fuels and bioenergy: This includes government targets and incentives to anaerobic digestion which the United Kingdom and other governments provide to help them meet their committed targets. The availability of Carbon Credits (in developing nations): to those who avoid Carbon Dioxide emissions and apply Carbon Discharge Management (CDM): The developing world has been able to apply and obtain Carbon Emissions Reduction (CER) credits where they achieve carbon emissions reductions, and such reductions are achieved very effectively by installing an anaerobic digestion plant with biogas production and also using the waste heat to provide hot water to be used heating homes, or in factories. Easier planning permission: In the spring of 2012 the UK government also relaxed planning permission requirements for anaerobic digestion plants on farms, below a certain size. Rising oil prices: Suddenly traditional energy sources are so much more expensive. In the past AD was a much more expensive energy source, and to be honest it remains so when all capital spend up-front is considered, unless governments provide financial incentives. But, even in nations where incentives are absent the gap is narrowing toward mainstream take-up of AD. The above 8 points are the anaerobic digestion basics driving biogas plant development. Specially grown organic materials – biofuel food crops (e.g. maize, silage, clover). See also our bigger list here. A gas: Largely methane – a fuel. Solid fibrous material (“digestate”); which is spread without further treatment, or after post composting (maturation), to provide organic matter for improvement of soil quality and fertility (improves soil structure and reduces summer irrigation demand). The liquid fraction; contains two thirds of the nutrients and can be spread as a fertiliser and sprayed on crops. Where co-composting on farms the liquid and solid fraction may not be separated and the digestate is spread as a slurry. If you know of more reasons for growth in biogas production, or would like to add to our list of “anaerobic digestion basics” source materials, we would like to hear from you. Please use our comments form below to add your reasons for the rising number of Anaerobic Digestion facilities. This is a great document which is educational. I was looking for an article such as this. I wish you can discuss to help us considerably more. Excellent informative data. Diana you point out good information on making that decision to begin and line business. Being online do1s2&#8ne7;t mean guaranteed success and as you say, you have to work at it’. Interesting and vital useful info on biogas. Still, to me in order to make a really interesting blog, you need not only to inform about something, but do it in an interesting way :). Some parts are good but others I find hard to understand the meaning. you should make more simple to read. I will be making time to learn about your anaerobic digestion subjects and keep track of new improvements inside the scientific research of dealing with carbon usage reductions. Hello everyone, I am new to the biogas subject. All looks great for my study work, pleased to look at a lot, thank you! I was thinking I don’t know what to do as I have a lot of of work to do next semester. Will be using quite a bit of your ideas from this website. Hopefully it will all go well. Wish me luck. The most basic AD facilities are. small-scale biogas reactors which are typically designed to produce biogas at the household or community level in rural areas. Just pointless spam… Why do they do it? Your pages I like. I am suggesting that at present, over a million biogas plants already exist in China. We made the finding that they meet more than 80% of the heat demand of the rural localities where they are located. Germany has over the last 20 years produced no more than the region of 5,000 biogas production plants. UK even less than Germany. Do you know what I am saying? You can go to the Chinese who do the best at having knowledge on the basis of biogas making. That is my thought. I’m no expert on biogas, but for me I would advise everyone to think about going green in terms of energy use in small steps, especially if your home cannot accommodate the solar panels or wind turbines necessary for a major infusion of green energy. Things like laptops, cell phones, iPods and other small gadgets can easily be powered up with smaller solar cells, and if you can also use biogas for night time power – you are made. 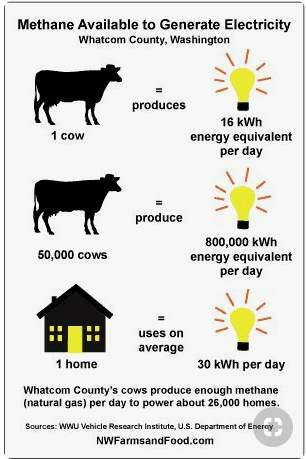 Biogas is awesome but did you know this tip about renewables? Who knows the biogas basics and knows how to tell me what I need? Tell me. Reply quick. This is one of our sites of interest in the resources we have a link to. We are telling you because our website coder says to tell every site we are linking to them. I trust you have no objection, and is OK? what is basics? Look like definition plus talk about? Is good. Have found it. Here is an excellent Web Page, that we encourage to visit. I need help to calculate what size digester i need for a food waste concept digester and also I would seek to know what quantity (maybe just rough estimate) of energy i could expect to get as output from the digester at a average output, could you help me out with this?﻿ Send reply to my email. very informative article. I am working at waste water plant it has made me understand the plant.﻿ Now I want to build the biogas plant. Thanks a lot for your efforts﻿. Does it work with all foods or just organic food?﻿ Good.